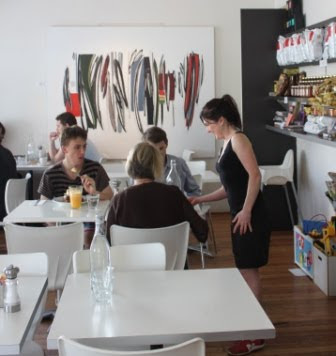 If you want a place to linger then suggest heading a little out of the way to Sideways Deli Cafe in Dulwich Hill. 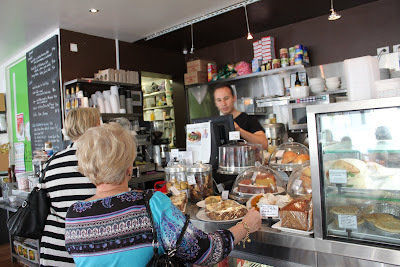 Owned by sisters Jacqueline & Danielle, this neighbourhood cafe is a walk away from the cosmopolitan hustle of the centre of Dulwich Hill. It has a sunny outlook and is certainly a favourite with the locals as at 1.30pm there was only 1 table left. It’s not just a cafe but also stocks a range of foods from olive oils, fresh baked cakes, tarts and quiches, relishes, jams so something to take home or a little gift. The menu is a varied temptation, and also a wide selection of specials so you can guarantee if you’re a local you can not only enjoy your favourite but also be tempted by a new creation. 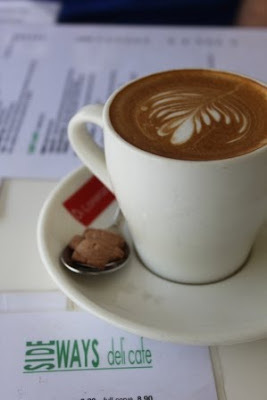 Breakfast is available till 4pm on weekends, and the menu represents the suburb’s cosmopolitan links e.g. Green eggs – scrambled eggs with pesto, fetta, bacon, tomatoes on wood fired toast or a the mountain of corn fritters, topped with spinach, haloumi and tomato relish. 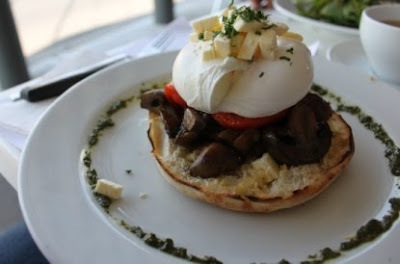 I indulged on one of the breakfast specials poached eggs with mushrooms, roasted tomatoes, fetta, pesto on garlic turkish. Oh and what a delight, my eggs perfectly soft and runny, the fetta adding some richness and a hint of saltiness with that little zing of garlic on the toast to truly add the Mediterranean touch. 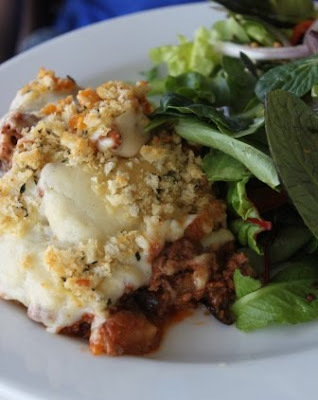 Mr G went straight to lunch enjoying the housemade Lamb Moussaka, which is the ultimate in comfort food - rich lamb mince, gently cooked in a tomato and oregano sauce layered with chargrilled eggplant and topped with a tantalising creamy white sauce and a crisp, cheesy breadcrumb topping. Many a Greek mother would be proud! Yet the menu continued to torment me, I couldn’t stop there and had to indulge in something sweet to balance it all out! Don't expect not your typical dessert menu.....here’s not a sticky date or chocolate mud cake or cheesecake in sight. Feast your sugar cravings with Middle Eastern orange cake, Persian Love Cake (a mix of ground almonds, freshly grated nutmeg, eggs, pistachio & greek yoghurt) , Viennese biscuits, or the less exotic but equally delicious, Lumberjack Cake with caramel drizzle. For the more traditional enjoy a slice of Lemon Tart, Banana & Walnut, Carrot & Walnut or Apple & Date Cake, or a generous wedge of Warm Housemaid Apple pie or a Choc Chip Cookie. I desperately wanted to try the Persian Love Cake, alas the early birds caught the worm and not even a crumb was left! Though was not disappointed. 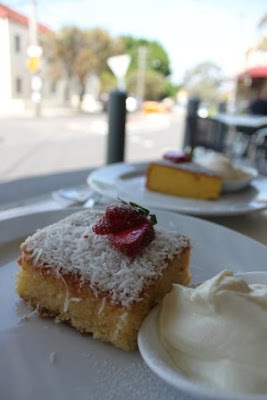 I highly recommend the Greek Coconut Cake. It’s moist with a delicate coconut flavour and texture due and soaked in lemon syrup. It's sweetness perfect with a dollop of creamy Greek yoghurt. Mr G enjoyed the Middle Eastern orange cake which is made by simmering whole oranges, then blending with almond meal, eggs and sugar. It's zesty, soft, and although probably not conventional across the seas....it’s great with ice cream. All perfect with a shot of coffee or a T2 herbal tea, try the Marrakesh Mint, a great way to sooth and settle a long lunch, all served with a Tiny Teddy. Sideways is a great place, service is friendly, unobtrusively attentive and children & dogs welcome, and not a merlot in sight!